Once Rev Racing driver Collin Cabre grabbed the lead in Saturday’s Dover Sober 125, he never gave it back. Cabre passed Rico Abreu right before the lap 70 break to score his first career series win at Dover and the second for Rev Racing in 2015. The 21-year-old rolled off from the 12th position and wasted no time in going to the front. “The car was great right off the truck,” Cabre said. “It’s basically all of us had to be good off the truck to win. When we came in for those pit stops, we made no adjustments and the car was just good. I can’t say any more about it. The thing was just phenomenal. It’s easy to do when the car’s that good. By lap 26, he was up to third in the No. 2 Rev Racing Toyota before losing the spot to Abreu 12 laps later. The two ran 1-2 while NASCAR moved the half-way break to lap 70 and Cabre was leading the event. Collin Cabre is all smiles in Victory Lane at Dover International Speedway after scoring his first career NASCAR K&N Pro Series East victory Saturday. The win for Rev Racing was their second of the 2015 K&N East season, after picking up their first win in August at Virginia International Raceway with Sergio Pena. He filled in for Jay Beasley, who returned to the No. 42 Toyota for Saturday’s season finale at Dover. Series veteran Eddie MacDonald came home second, with Rico Abreu, Spencer Davis and Nick Drake rounding out the top five in the rain-postponed and rain-delayed event. Davis’ result gives him back-to-back top-fives with NTS Motorsports to end the year, while MacDonald’s second-place finish was his first top-five since a fourth-place effort last fall at Dover. Meanwhile, points leader William Byron started on pole and led the race’s first 57 laps, only needing to finish ninth-or-better to claim his first K&N Pro Series East championship. And he did just that, as the Charlotte, N.C. native finished ninth in the Drive Sober 125 to win the title in his rookie season. 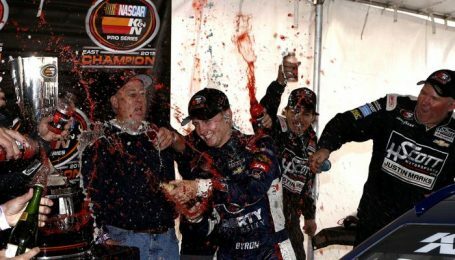 Byron’s points lead began to dwindle after Watkins Glen when championship runner-up Scott Heckert scored the win in the Bully Hill Vineyards 125. Heckert closed to within 13 points before heading into the season finale, with Richmond winner Austin Hill trailing one point behind the Ridgefield, Conn. native. Hill and Heckert tried to pounce on Byron early in Saturday’s race at Dover until the fight for the lead became a four-car battle. Hill, the two-time defending Dover winner, got to the outside of Byron on lap seven but couldn’t clear the HScott Motorsports driver. Heckert got by Hill to take second on lap 15 and Cabre got third after that. However, the No. 22 slowed on lap 37 when the engine went on the Don Rich Ford, ending any chances at winning the 2015 title. Heckert’s day started from the second spot and never led a lap in the Drive Sober 125, a race that was 25 laps less than in years past. Before lap 70, the No. 34 car fell to tenth and stayed there when the checkered flag flew. He finishes the year second in points — just behind Byron and making it a 1-2 in points for HSMJM. The championship is the third consecutive for team owner Harry Scott Jr. with two different teams (2013 – Dylan Kwasniewski, Turner Scott Motorsports; 2014 – Ben Rhodes, Turner Scott Motorsports; 2015 – Byron, HScott Motorsports with Justin Marks) and Byron becomes the fifth rookie driver to win the series title, joining Joey Logano, Ryan Truex, Kyle Larson and former teammate Ben Rhodes. Byron is also the fourth-youngest champion in series history, at 17 years, 10 months and four days old. Byron will be officially crowned as the 2015 NASCAR K&N Pro Series East champion at the NASCAR Night of Champions Touring Awards at the Charlotte Convention Center and the NASCAR Hall of Fame in Charlotte, N.C., on Saturday, Dec. 12. Kyle Magda is Race Chaser Online’s Associate Editor and a co-host of both Motorsports Madness and the Stock Car Steel/SRI Motorsports Show, airing at 7 p.m. ET on Monday and Thursday nights, respectively, on the Performance Motorsports Network. Magda broke into racing in mid-2001 as the sport’s tide was beginning to change towards the current modern-era formula, but still has an affinity for the history of NASCAR’s earlier days. The 22-year-old currently studies print journalism at Penn State University and can be found traveling to numerous tracks across the country, covering everything from NASCAR and the ARCA Racing Series to the UNOH All-Stars Circuit of Champions and the Super Cup Stock Car Series.